Shake up the travel industry! Collect moments with Airtrotter.com, a highly scalable global company where people connect and plan their ultimate trip together. Book your journey today! Become part of one of the first worldwide travel platforms that closes the gap between travelers and locals, a travel platform where people can create, share and optimize their new travel journey or existing travels. A platform where people can plan their entire trip, from the beginning till the end within 15 minutes. Airtrotter is an online platform where people can plan their trip day by day on an easy-to-use interactive map. Want to stay in a fancy hotel? Want to sleep as the locals do? Want to see the top sights? Want to have an excursion with a local? Everything is possible within your trip. The concept of Airtrotter is based on a worldwide problem: fragmentation of the current market. Where people have too many options where to book a trip and find information regarding their travel plans. We call this: information overload! Besides, where can you plan a trip where you sleep at a local for one night and the rest in a luxurious hotel? Or get information what to see and what to do by a local expert? Our platform will be integrated with social functions in a way travelers can interact with each other. See which trips your friends are planning, add friends to your trip, write reviews, help your fellow travelers with their trip, add blogs and connect with other travelers. * Interact with locals, friends and travel experts! With Airtrotter people are able to make, share and sell trips on their very own marketplace. * A unique concept where our fellow travelers plan an ultimate trip especially for you! Be your own travel agency, attract clients and sell your 'home-made-travel-itinerary'. No more hassle with professional travel agencies, just you and your local expert. Premade trips for everyone! * Some of the functions will be added in a later phase. All inclusive booking; Book your complete trip with all necessary information on where to go and what to do within minutes of your time. Everything in one place. Best possible price/quality ratio for all your trips; Because of multiple affiliates and input of other travelers. Highly scalable global company; We have no constraints regarding geographic expansion since everything happens in English and online. People- and experience-focused: Personal contact with locals and travel experts. By travelers for travelers. No more professional travel agencies; Let locals and travel experts create the trip you want on our platform. In year two, we'll add display advertising as another revenue model. Thanks to segmentation opportunities on Airtrotter, advertisers have the opportunity to reach exactly the part of the population they wish, which makes advertising much more effective. Next to display advertising we'll introduce premium memberships. More features and verified members are key. Our fourth and last revenue stream is based on a marketplace strategy. This stream will be added end of year two. Users will be able to create and sell trips. Be your own travel agency on Airtrotter. Building up our awesome travel community on social media. Building up our mailing list. Done our first bookings without any marketing (see attachments), with visitor numbers climbing. Six interns working out a (online) marketing plan. In order to start we will need € 40.000 as a start-up capital. This capital will be spent on both pre-operational and operational expenses. Where € 18.000,- will be spend during our building phase, € 20.000,- for marketing purposes and another € 2.000,- for other unforeseen expenses. We aim to use this start up capital for the next twelve months to create brand awareness and start our online business. Jeroen is founder of a growing online fitness and health platform. He is a successful online entrepreneur with a large social network. His creative mind and business knowledge are essential for our startup. He will be highly involved in the future of Airtrotter.com. Airtrotter will be a platform where travelers come together. Travelers are able to plan their ultimate trip day by day on an interactive map. Including sights, attractions, hotels and more. With an integration of Google Maps and Google Places. Our users are able to pick top places to see, add them to their trip and plan the trip they want with recommendations of friends and locals. Together with out affiliate partner Booking.com and their useful API, our costumers are able to select hotels on the same interactive map, add them to their trip and book the hotel they want with our partner Booking.com. We provide the information while actual bookings will be handled by our partner, which will be integrated in our platform to ensure our customers will use our platform for their entire trip. Users can choose whether they build their trip from scratch or use a premade trip of one of the other Airtrotter users. With premade trips all information is given; sights, attractions, even affiliated hotels. This way, people are able to book an entire trip without any hassle. Next to trip planning, we will integrate social functions in a way travelers can interact with each other. See which trips your friends are planning, add friends to your trip, write reviews, add blogs and connect with other travelers. * The possibility to interact with locals and friends regarding your travel plans. Airtrotter allows you to simplify your entire travel booking process by combining multiple tools. Book your trip from the beginning until the end, everything in one place. *Some of the functions will be added later. Airtrotter is a global company without any constraints for geographic expansion since everything is in English and online. We’re expecting an exponential growth due to the snow-ball effect of people inviting each other in their travel plans. Next to this, everything goes automatically, there is hardly any manual work for us. Most of our time and investment will be spend on optimising the platform and try to attract new users. This makes Airtrotter highly scalable. Day by day planner - based on Google Places. Social Space - small with some basic information and the ability to save and book trips. Premade trips (on frontpage) - made by premium / hand-picked users. Building out our marketing strategy. Budget travelers with low funds but love to travel. The more the better. Middle class travelers with basic income who love to go out on adventure. Middle class travelers with basic income who often follow the beaten path. High class travelers with higher income who prefer luxurious trips. Apt to be adventurous or thrill-seeking. Want to get away from it all. Tend to be active and love the outdoors. Open to content of destination discovery and exploration. Lovers of history, geography, culture, humanity and art. Often seeking typical, once in a lifetime experiences. Prefer planning and booking own trips. Take pleasure in the process of planning travel. They are open to offers and relevant persuasive messaging. Seek out and consume travel content for enjoyment. Are always thinking about their next trip. Browse through travel content and spend time with it. Open to content to put on their bucketlist. More information can be found in our Targetgroup Analysis. 12,7 million people went on holiday in the last year (approximately 80% of the entire population). 75% - 80% of this group use the internet to be inspired for their next trip. 13% of that group are inspired by friends and family. With a total of 35 million booked holidays per year. Expected growth of 3% next year. The Dutch spent 16 billion euro on travel purposes. Where 13 billion is spent abroad and another 3 billion domestically. With those numbers, there is a potential market size in The Netherlands of 10,2 million people who use the internet for travel purposes. Those people are good for 12,8 billion euro. In the second year, we will expand to other European countries. Where we target three of the biggest online travel countries:United Kingdom, Germany, and France. Each with a period of 4 months to expand. After Europe, in year three, we will launch Airtrotter in the United States for 6 to 8 months. Canada, Australia and New Zealand follow in the upcoming months/years. Since everything happen in English we have no constraints regarding international expansion. In addition, over 1.5 billion people use the internet for online travel bookings. Worldwide, travel is the single largest category of products sold over the internet. TripAdvisor has 375 million monthly visitors. Couch surfing has more than 5.5 million members. Travelers spend more on sightseeing (53%) than on shopping, souvenirs and nightlife combined. Next to this, internet travel booking revenue has grown by more than 73% over the past 5 years and still is growing. Our competition will be on different levels, from product competition to budget competition. Most of our competitors are ‘profit-focused’, where we try to be more open and use a freemium model. This way our customers can use our platform for free and can optimise their travel plans in any way they want. This presents an opportunity for Airtrotter by focusing on a free-to-use platform where we build in specific other revenue models. Unlike most our competitors, we are experience and people focused. The feedback of potential customers about our concept is very promising. Currently we are testing our demo with a positive response. "Love the idea that I am able to create the trips we have on Peri Peri Reizen on Airtrotter and sell and promote them over there." "I like the fact that I can build my own trip, the way I want and see directly if I am able to afford the things I want to do within my budget." "No longer 18 tabs open in my browser to find the right information of a destination, just one with everything I need." "The idea of Airtrotter is an answer for the future of online travels. 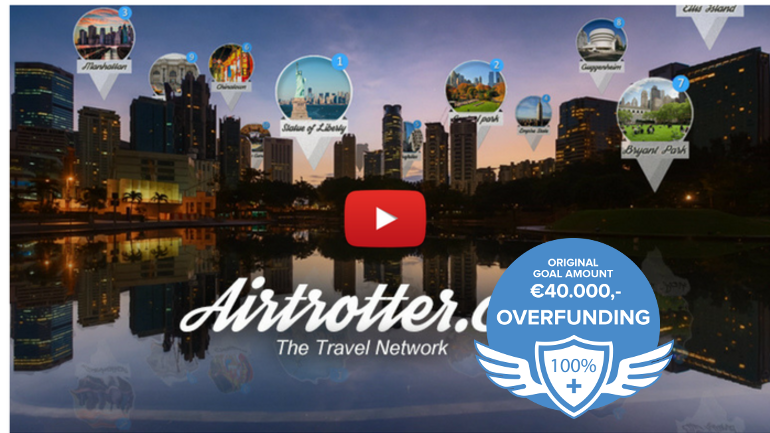 Airtrotter could change the entire travel industry." Airtrotter is a global company without any constraints for geographic expansion since everything happens in English and online. We’re expecting an exponential growth due to the snow-ball effect where people are inviting each other in their travel plans. Our expectations are to reach a unique visitor count of 2.750 per month after the first year. At the end of year 2 after we've launched in other European countries, we expect a unique monthly visitor count of 7.500. In year 3 with the expansion to the United States and other English native countries we climb towards a unique visitor count of 20.000. Next to B2C, we also want to focus on B2B. Where we can make great deals for our clients if they (for example) book hotel rooms, flight tickets or car rentals with Airtrotter. However, this is not our main priority. Become part of one of the first worldwide travel platforms that closes the gap between travelers and locals, a travel platform where people can create, share and optimize their new and existing travels. A platform where people can plan their entire trip, from A to Z within 15 minutes. Plan your trip day by day on an interactive map including sights, attractions, excursions, hotels and more. Everything you need in one place without any hassle. The fun of your holiday starts at Airtrotter. Book the trip YOU want, YOURSELF! Within a couple of minutes, no more hours and hours trying to find the right information. Be inspired by other travelers; locals and travel experts. Combine hotel stays with unique local stays. Book a professional excursion or let a local guide you. Combine and see what's possible within your trip. Book a trip made by experts without the costs of a professional travel agency. The best price/quality ratio for your travels. You're in control. Don't just book a destination, book a journey! To reach our target audience and create awareness we will use different marketing channels. Since we operate online, our target will be focused in the beginning on online marketing. Three of the most important paid channels at the start will be Search Engine Marketing, Influencers and Social Media Marketing. Our main marketing goal for our first year will be a unique monthly visitor count of 2.750 (after bounce rate). After each period of three months we will group people up by similar characteristics like demographic, attitude and behavior. We will target our specific audience group by creating personas. Based on those personas we will build a strategy for our marketing channels. Next to those channels we always find a creative way of finding free publicity. More information can be found in our marketingplan. Experience a growth in new customers. Growth of approximately 4 new customers per month in year one. Growth of approximately 5 new customers per month in year two. Year one goal - on Platform: 5% of our monthly visitor count (overal count year one: 12.400 visitors): 620 members. Year one goal - Social Media: 3000 members. Year two goal - on Platform: 10% of our monthly visitor count (overal count year two: 59.650 visitors): 5.965 + 620 = 6.585 members. Year two goal - Social Media: 12.000 members. To be recognized as a serious travel platform. To achieve these goals, we will use different marketing channels to reach our customers. A more detailed plan can be found here. Our startup year. We expect to launch our Minimum Viable Product (MVP) in May 2017. *The marketplace will bring input to the affiliate revenue stream. The official launch of Airtrotter will be determined by: Our crowdfunding campaign and after that the launch of our MVP in May 2017. The consumer always try to find the best price/ratio for their travels. The market is fragmented where people want a convenient and easy tool to plan their entire trip. No more 18 tabs open for all the information they need. Travel experts and travel agents jointly agreed 'local experiences' is an upcoming trend. Travelers want to see all the sights and attractions, but are also very interested to learn from the locals. Airtrotter makes it all possible! Besides this validation, a couple of months ago Google launched Google Trips. An app where people are able to plan their trips with information from Google and their Gmail account. One of our competitors, however we are community focused and our customer can book their complete trip with multiple affiliates. With this launch, Google also thinks there is a huge potential in the current travel market. We expect a monthly visitor count of 2.750 in the first year with a conversion rate of 0,7% (19 customers). Based on our marketing strategy and international expansion (Europe) we expect a monthly visitor count of 7500 in the second year with a conversion rate of 1,0% (75 customers). In year three we go overseas (North America) and expect a monthly visitor count of 20.000 with a conversion rate of 1,4% (280 customers). In order to start we will need € 40.000 as a start-up capital. This capital will be spent on both pre-operational and operational expenses. Where € 18.000,- will be spend during our building phase, € 20.000,- for marketing purposes and another € 2.000,- for other unforeseen expenses. We aim to use this startup capital for the next twelve months to create brand awareness and start our online business. Our start-up capital will be spent on pre-operational expenses (website and product development) and launch support (marketing campaigns). We aim that 2/5th will be used for website development and 3/5th for marketing purposes. Premium Airtrotter User, Personal Airtrotter T-Shirt & Lonely Planet book: Wereld Wonderen. In the second year we expect to need more funding for scalability and growth of our business. This gives you as an investor the chance to convert into shares. We think a second round of crowdfunding will match our funding needs, however external funding is also an option. * With a value of € 100,-. Low risk: Product - What features to add in our product with the upcoming sprints. To prevent this risk, we can test any upcoming feature with our current users. Low risk: Team - Our team consists of three entrepreneurs with the knowledge of starting up a business. There is always a small risk when bigger decisions have to be made. Communication is key with this risk. Medium risk: Market - The lack of market knowledge and brand awareness of Airtrotter. Medium risk: Financial - Our crowdfund campaign to start with and the funds we have after our campaign. We will have a cash runway after our crowdfund campaign of approximately twelve months. In year two, we expect to need more funding for scalability and growth of our business. If this doesn't work out, cutting our expenses is an option. Medium risk: Competitors - Our competitors have already started their online business. However, they are focused on the tools they provide, while our focus will be on community building and word-to-mouth communication. Medium risk: Community - Attracting enough people to the website to make sure the community does what it is supposed to do: Create Trips! Risk absorption can be done by creating fake accounts (travel experts / locals) with multiple trips on their names. High risk: Market - Knowing our customer and their specific needs is one of our top risk. Risk prevention can be done by customer service and after sales, next to good testing of our upcoming product. Lender issues a (subordinated) convertible loan to convert at a later stage to depositary receipts to become a shareholder of the company. Lender expects an (exponential) growth of value of the company with the possibility to sell the depositary receipts with a capital gain. However in most situations such capital gains do take more than an additional five years after conversion to be realized. In exchange for the possibility of a high return in case of a scenario of exponential growth of the value of the company, there is a risk the investment will be lost in case the company is not doing well. Please ​read here​ carefully the risks while investing in shares or loans offered by the companies published on Symbid. Here you can also obtain insight in the default report of Symbid before deciding to invest. The main risk of this start-up is a lack of brand awareness. For this we have a marketing strategy in place which can be tweaked along the way. This to ensure that we create enough brand awareness, get enough visitors and receive enough bookings.